WR Steve Smith, who signed with the Bucs in April, has announced that he will retire from the NFL after 6 seasons. 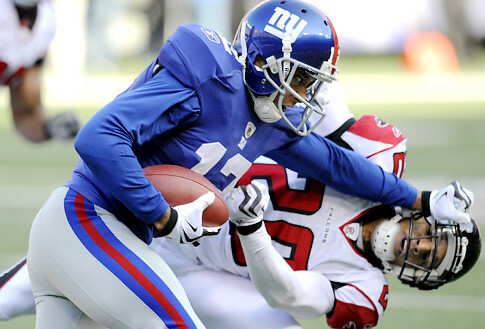 Smith set the Giants single season receptions record in 2009 with 107 but only a few years later is done in the NFL. What? if anything it will just fuel Cruz even more to stick to his demands, he will try to get as much money as he can because this shows that even successful, Pro-Bowl WRs may retire at age 28 because of an injury. Yes, you think that he should learn from Smith turning down a long-term deal [like he was offered at one point] but i highly doubt that is the lesson he will learn, this will probably just remind him how an NFL career is short and Cruz is only a little bit over a year younger than Smith is now. No, take notice kenny phillips. He already is following in Smith's footsteps. The curse of the ex-Giants. You must not know a whole lot about Steve Smith's contract history. Eli made him out to be 10x the player he actually is to the point where he actually was one of the top WRs in the NFC to make the pro-bowl. Steve Smith couldn't do anything with Mike Vick or Sam Bradford, regardless of injury. Just another product of the Giants' office. I love Cruz and it seems that he's going to remain a Giant once both sides come to terms, but the Giants aren't going to overpay for anyone not named Eli Manning, not saying he's not deserving of that money but QB salary in general is just flat out ridiculous. So you deny Steve Smith was one of the best route runners in the league before he injured himself? You can't say "regardless of injury" as it blatantly ruined his career. Shame, Smith was one of my favorites of all time. Him and Eli were fantastic together. Sad day, could have been still going today if it weren't for his injury. I feel for him. He was never the same guy after that knee injury. Damn shame. Best of luck in life Steve. His production derailed even before his injury in 2010. He shouldn't have left, but did and quickly became a nobody. If it's about the money, then okay fine let someone else overpay you and have fun derailing your career. He was a great route runner but also a product of the offense. Eli Manning made Steve Smith the probowler that he was and he got greedy and left the Giants prematurely while a deal still could have been made and signed with a divisional rival. The Giants know how much Steve Smith is worth, how much Kenny Phillips is worth, how much Victor Cruz is worth, given their health and production. If Cruz is smart, he'll sign and not be greedy and seek up to 10 mil. Don't try to tell me 8m/yr. is not enough money thats complete BS. I think to suggest that Eli singlehandedly raised Smith from bum status to catch machine overrates Eli, to be honest. He was on pace for another 100+ catch, 1000+ yard season in 2010 so it's not like he was a fluke either. Shame the injuries derailed his career, if not he'd be a great asset. Last of all, thanks for the big catches in 2007 Stevie. His production derailed even before his injury in 2010. That's simply not true. Through the first 8 games of 2010 (he got hurt in the 9th game) he was on pace for another 90+ catch, 1000+ yard season. Smith was an excellent receiver with excellent route running abilities. His injury was in his contract year... the giants offered him 15 plus mill gaurenteed before the injury. He turned it down and then injury happened. He literally lost 15 plus million (ATLEAST) becaise he wanted more. Greed is a terrible thing.